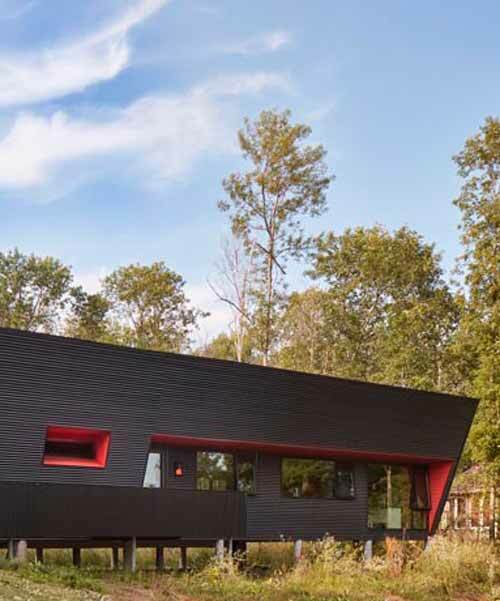 thier + curran architects (TCA) has completed a house for a recently retired couple on a wooded site near the bay of quinte, ontario. 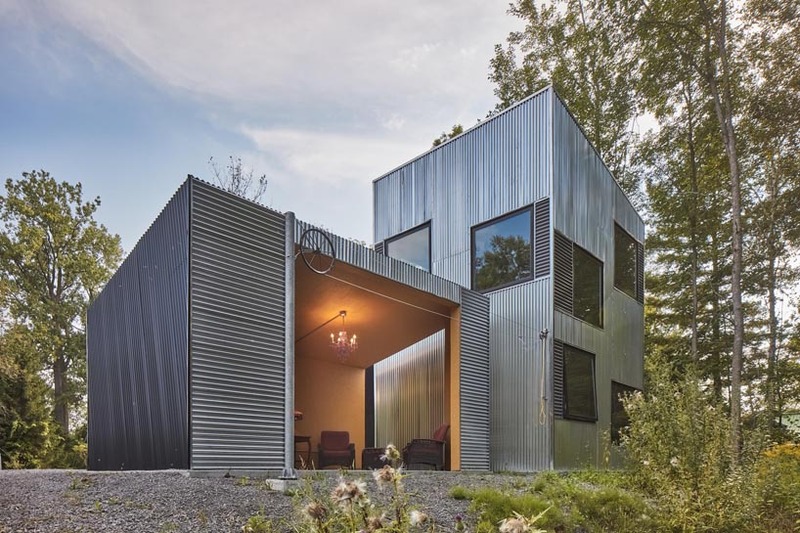 rather than one large structure, the project comprises a collection of contemporary, corrugated metal ‘sheds’ set within the landscape, that house the living quarters, a studio, a sheltered outdoor lounge space, and a garage/workshop to support their creative endeavors. 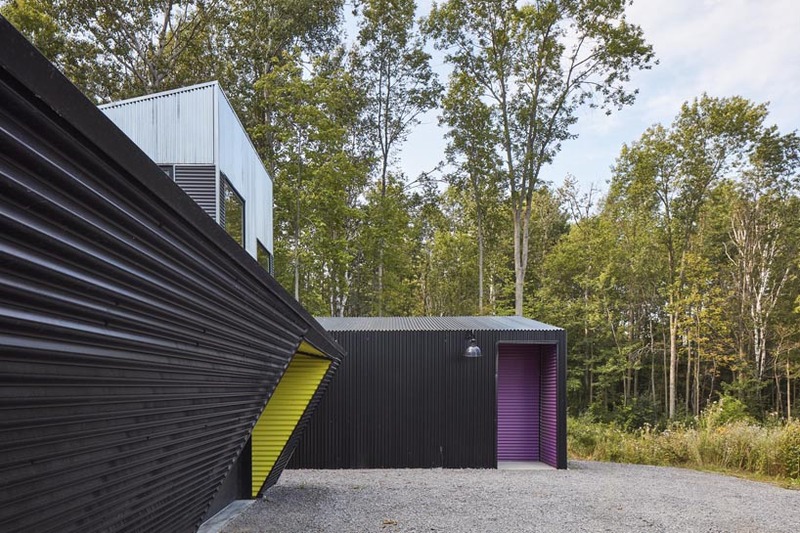 thier + curran has elevated the dwelling on piers, and planted the front ‘lawn’ as a meadow of lavender that will be farmed and harvested. fit with extensive glazing, the central living space includes individual studies and one bedroom. 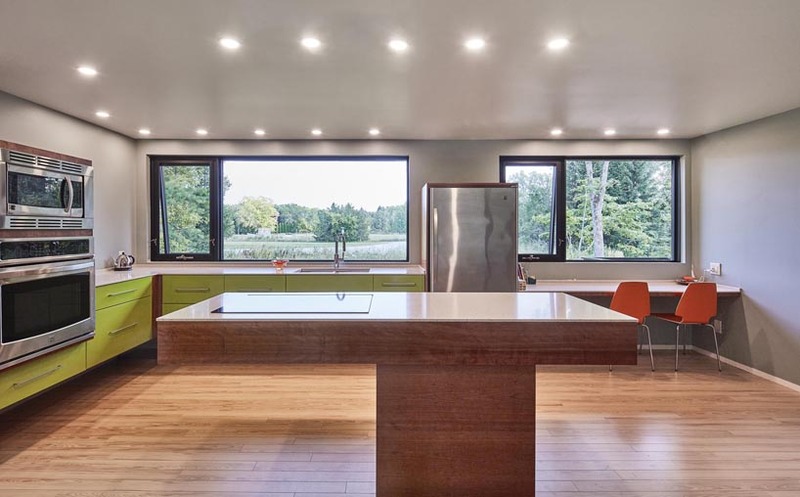 custom millwork elements form a media wall composed of varying depths of cherry wood-veneered rectangular forms, while the lime green kitchen casework is constructed on steel plinths so it appears to float – ‘a repetition of the floating structure of the house itself’, as the architects note. 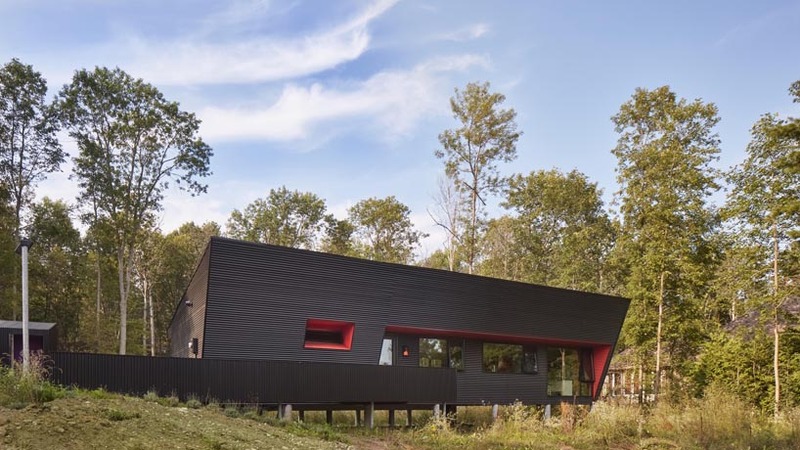 on a separate shed, a tower-like studio and semi-enclosed space reach into the woods as a retreat, connected by a raised boardwalk. the tower is punctuated by an asymmetrical composition of windows to allow light and views of the surroundings into the space. the tower interior has been left ‘unfinished’ with exposed wood studs and sheathing, lit by clerestory windows. 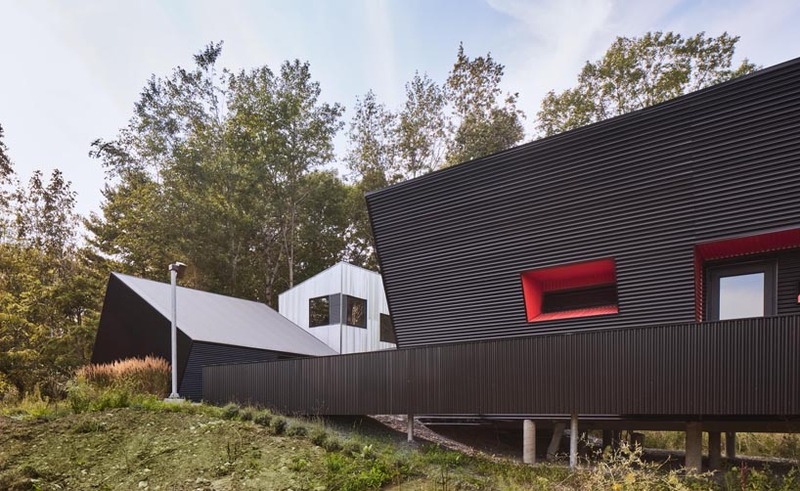 the two-car garage and workshop structure emerges from the landscape as a splayed rectangular prism, arranged in contrast to the dwelling. a steel and wood slat gateway and low planter walls of stone gabion baskets define the entrance courtyard with a steel bridge spanning to the entrance. 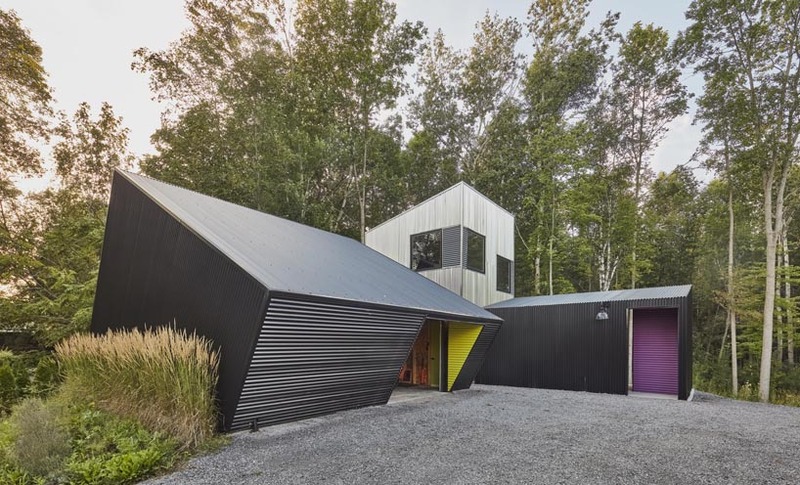 minimalist, simple, economical forms and industrial materials are used throughout the project, while the distinctive, wedge-shaped form of the house and garage add movement and dynamism to the composition of structures. 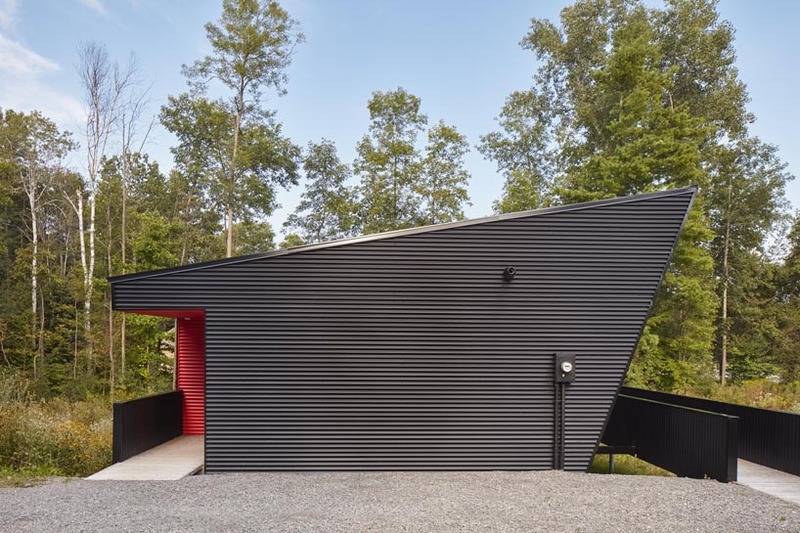 black corrugated metal is used as the main cladding material, with the exception being the tower-like studio, where the structure’s contrasting vertical form has been emphasized with vertically-oriented galvanized corrugations. 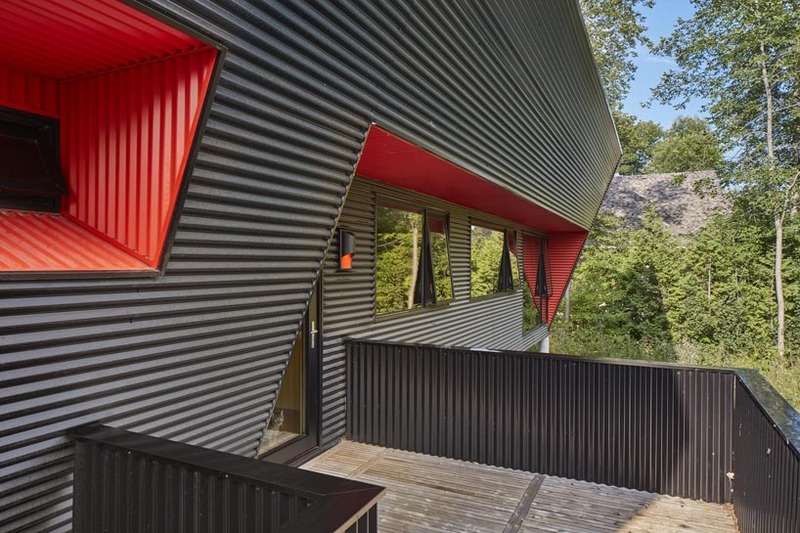 accent metal trims add depth and are painted with bright, high-gloss automotive paint, as a tribute to the owners’ obsession with 1970’s muscle cars.